The Samsung iBG-2016 is a powerful layer 3 ethernet switch that accommodates mid-to-large locations including remote branch and regional offices, and small-to-medium sized businesses. 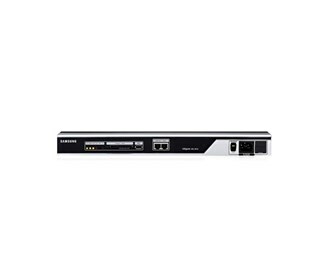 Packing a rich feature set in a compact U1 size, the Samsung iBG2016 provides a robust and resilient platform to build and maintain converged IP Based Video Networks. The Samsung iBG-2016 has many exciting features for users of all types. The Samsung iBG-2016 is sold as a Brand New Unopened Item.